An alabaster tomb in the parish church of St.Patrick at Nuthall is said to represent the tomb of Sir Robert Cokefield, 1360. There is no inscription on the tomb, but the identity is assumed (says Fellows*) from the pointed bascinet helmet, camail and horizontal hip belt, being all indicative of a knight of Sir Robert's time. 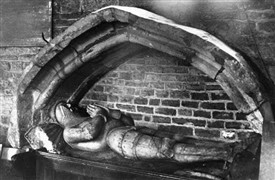 The effigy resides in an arched recess which is probably its original home, although the area cut away to accommodate the bascinet is rather crudely done. This page was added by Website Administrator on 02/04/2015.